Everything we know we learn from Nature. In order to find harmony in life we all need to learn how to observe Nature and learn the laws that govern our Universe. Atoms as well as planets follow their natural cycles. We all are a part of Nature and we go through the cycles as all. However, there are people who get stuck in a loop of problems while others are able to reach the next level by overcoming challenges of crisis years. Nature gives us a chance to prove ourselves worthy of reaching the next level during the crisis years. It also has provided us with a map and the timetable of the crisis years or exams in life (which happen during the time we change from one cycle to another). This map is based on the seven chakra system and can give answers to what we need to learn during each life cycle. The first 49 years of human life can be characterized as the “spiritual childhood.” Nature lets us observe how it works without demanding anything in return. When we become adults in the eyes of Nature (some reach that point before 49, some never do) we are ready to give back through our own creativity. The 7×7 Chakra Life Cycles table is a great illustration of what the goals for each cycle of human life are. It is supported by ancient esoteric teachings as well as spiritual science research. Even modern contemporary science has proof that all cells in the human body change every 7 years. You can see for yourself if this model of chakra life cycles resonates with you. During our first 7-year cycle we need to ground ourselves. Earth Chakra dominates the energies of this cycle. This is the time when our immune system is activated, our energy shell begins to form and we begin to interact with the surrounding environment. It is one of the very important cycles, since what we learn during these seven years becomes the foundation to what we will build our life upon in the future. Sacral chakra is the one that is responsible for our sexual energy and it governs our second 7-year cycle. It is the time when we begin to identify ourselves with our gender. We become active in sports and are eager to learn new things. By our third 7-year cycle we have already lived through puberty and are ready to change the world. Solar Plexus chakra guides us through social groups so we can find the place where we belong. We begin to learn the rules society plays by in practice. This is the cycle when virginity is lost (for most people) and it makes us think that we are ready to be adults. From age 21 till 28 we begin our adult life. We are led by our Heart Chakra. We need to learn how to correctly invest our emotions in the world in order to get back the best possible return on our investment. During this cycle we need to break away from the nest of our parents and strive to build one ourselves. The energies of our fifth 7-year cycle are governed by the Throat Chakra, the one that is responsible for our will and our creativity. It is the time when we are free to exercise our own will within the limits of the mission of our higher self. It is a great time to establish the true channel of communication with your Spirit (if you have not done so yet). 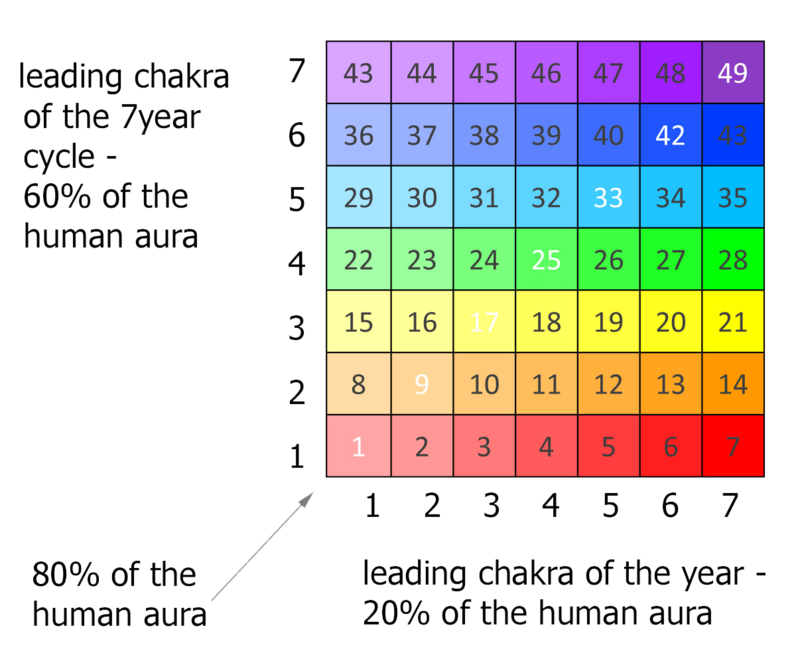 The Third Eye Chakra guides us from 35 to 42. Our inner philosopher is born and we begin to look for the meaning of everything. We no longer can just talk the talk, we need to walk the walk. It is the time of the final battle: Wisdom of Heart vs. Wisdom of Logic. Crown Chakra is the main energy source during the last cycle of our “spiritual childhood”. It is the time when people have the final chance to either follow their own ego or move to the next level through cooperation with their own higher self in realizing the potential that was given to them at birth. As spiritual adults we all need to become a fully pledged member of our spiritual hierarchy, take responsibility for our potential and use our creativity to empower the world around us. To learn more about chakra life cycles, how to ecologically go through the crisis years and what powerful visualization techniques you can use in order to get back the energy that you might have lost, please see the “We Are One Higher Consciousness … So What?” ebook. Next post An Inspiring Video You Must Watch!